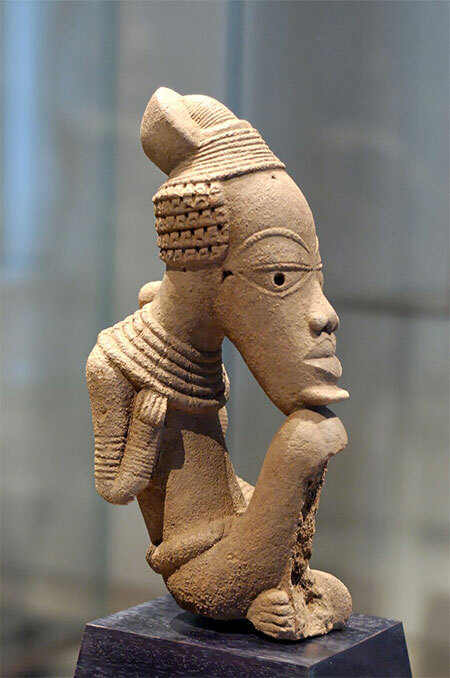 The most ancient of the Nigerian cultures known to us is also that about which least knowledge has been available. This is the ancient iron-working culture, known as the Nok culture, whose remains, of remarkable artistic value, have been coming to light in the ‘Middle Belt’ region of Nigeria during the past twenty years. The term ‘Middle Belt’ usually refers to the country around and to the north of the Benue and the Niger. It is the home of the many tribes who lie between the Ibo and Yoruba in the south, and the Hausa and Kanuri of the ancient states and cities of the Northern savannah. The Middle Belt includes the valleys of the Benue and the Niger as far as their confluence.